Instead of an agenda to address pressing social needs or a new role for First Nations in Canada's future, Friday's meeting between the PM and aboriginal leaders just underscored their growing divisions, Chris Hall writes. The strongest image from Friday's meeting between Stephen Harper and the Assembly of First Nations didn't come from inside the room where the prime minister met with a small delegation of chiefs. It came from outside, where hundreds of band members massed in front of the prime minister's office building demanding he come out in the rain to negotiate with them. For many, the rally in front of Langevin Block was more than just a protest. It was a poignant expression of how so many First Nations people find themselves on the outside looking in, when the relationship between them and the federal government — as defined by history — is supposed to be one of equals. The standoff on Parliament Hill added to the crisis atmosphere, or what interim Liberal Leader Bob Rae called the "tragedy of errors," leading up to this meeting and which makes it so hard to conclude anything positive can emerge. Instead of focusing on an agenda to address the pressing social needs faced by too many people living on reserves, instead of assessing what concrete measures could be taken to make First Nations more true partners in Canada's future, the meeting simply became a backdrop to the threat of more protests, blockades and an ever deepening rift between individual chiefs, and between First Nations and the federal government. In the process, AFN National Chief Shawn Atleo's attempt to use this meeting as a springboard for ''transformational change'' failed. His organization is clearly divided, with chiefs from Ontario and Manitoba refusing to attend Friday's talks. Most of his agenda remains unrealized. And his own future at the helm of the AFN — after winning a second term with a commanding majority just six months ago — is suddenly unclear, with calls from some chiefs for a non-confidence vote on his leadership. Stephen Harper also took a hit. His dogged insistence that the meeting must go exactly as originally agreed, despite the changing dynamics in recent days, reinforced his reputation as inflexible. And it further undermined Atleo, the one native leader with whom he had forged a strong working relationship. Not surprisingly, neither Harper nor Atleo spoke publicly after the meeting. The clear winners are the organizers of Idle No More, the grassroots movement that so unnerved the AFN in the past few weeks that every chief who spoke publicly in the days before the meeting made sure to praise them. It doesn't matter that the movement's demand to ''respect our treaties'' is far from specific. It also doesn't matter that the chiefs who sided with them late this week had their own shifting priorities in the internal politics of the broader First Nations' movement. 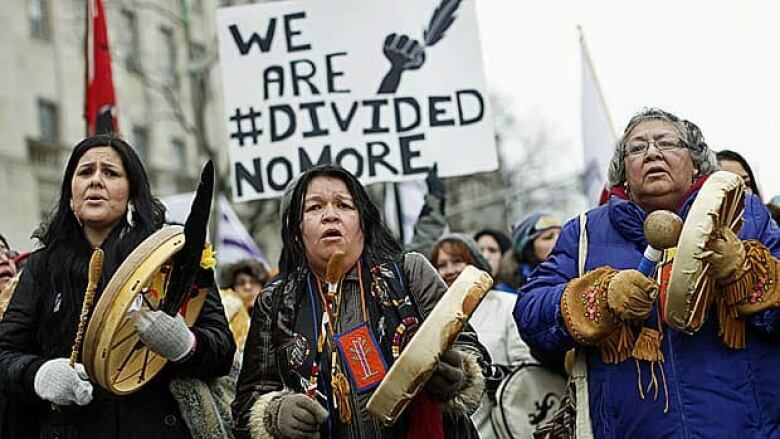 What does matter is that Idle No More has created a sense of purpose that goes beyond the AFN. Its organizers and social media campaign captured the imagination of a generation of young and increasingly militant aboriginal people who rallied across the country on Friday. They are those who see little to be gained from annual meetings with the prime minister, and even less to be gained from the incremental change on this file that has been the hallmark of Harper's time in government. The prime minister's approach made it all but impossible for Atleo to emerge Friday with something tangible from his list of demands going in. Atleo won a commitment that First Nations files will receive a higher priority inside the Prime Minister’s Office and its bureaucracy. And he came away with a promise that he and Harper would meet again in the next several weeks. But the tough issues: quicker resolution of land claims and treaty issues; a new financial arrangement that would tie federal payments to inflation and population; a school on every reserve; and a formal process that would bring Ottawa, the provinces and First Nations together to negotiate revenue sharing from the estimated $650 billion in potential resource development across the country, remain points of discussion. Absent any concrete gains, the immediate future holds only the promise of more blockades and economic uncertainty. Gordon Peters, grand chief of the Association of Iroquois and Allied Indians in Ontario, who boycotted the meeting with the prime minister in solidarity with Idle No More, said roads and railway lines could be targeted as early as today. Just last January, Harper played host to native leaders and spoke of the significance of 2013 as the 250th anniversary of the Royal Proclamation, a document First Nations view as the basis of many unresolved land claims and self-government. The prime minister talked then of the importance of ensuring aboriginal workers have the skills to work on resource projects, many of which are in or near their home communities. Harper reiterated the same commitments this week. But with no clearer timetable of how he intends to achieve them. And the truth is that very little has been done over the past seven years — since former Liberal prime minister Paul Martin negotiated the five-year, $5-billion Kelowna Accord with First Nations and premiers. "We are here today because the descendents of the people who first occupied this land must have an equal opportunity to work for and to enjoy the benefits of our collective prosperity,'' Martin said then. Harper, of course dismantled the accord. And the gaps persist. The Conservative government's approach has been to craft piecemeal programs to address specific issues, in some cases driven by crisis. The ultimate goal of ensuring First Nations communities benefit directly from developing the country's resource sector, and so gain true self-sufficiency, folds neatly into the Conservatives view that a more prosperous future can be built if there's a shared commitment. But that goal remains far off in the future. Today the talk is all about blockades and bringing Canada's economy to its knees until First Nations are treated as equal partners. Words that seem more easily translated into action.